Subaraknoidea hematoma (bleeding under the middle brain membrane, meninges) is usually included under the definition of strokes. A stroke is the common name for a blood clot in the brain or a brain heamorrhage. Bleeding under the middle brain membrane, however, has quite different reasons and symptoms than a blood clot or a heamorrhage in the brain tissue, and therefore deserves special attention. Around the brain are three membranes. The ultra hard skin called dura, the mid skin or araknoidea and the inner, soft skin called pia. If one of the arteries on the brain surface bursts then blood will fill the space between the inner and the middle membrane. Bleeding under the middle brain membrane occurs in around one per 10.000 persons per year in the western world representing only around 5% of stroke cases. Hemorrhages typically strike people between 40 and 60 years of age and slightly more often in women than men. This is a very serious condition. Bleeding under the middle meninges may occur for several reasons. In most cases, the cause is a dilation (ballooning) of a blood vessel - an aneurysm. Aneurysms can be either congenital (present from birth and sometimes hereditary) or less frequently due to other illness, such as polycystic kidney disease. When an aneurysm suddenly bursts blood will get trapped between the inner and the middle membrane and form a coating around the brain. The blood will mix with the brain fluid around the brain and spinal cord, and this facilitates the subsequent diagnosis (see below). When large amounts of blood leaks from the burst blood vessel the pressure around the brain increases and brain damage might follow while the increased pressure tends to reduce the bleeding. Bleeding can also be caused by other congenital defects in blood vessels or be the result of a blow to the head. A crack or just a snap in the head. In severe cases, death can occur on the spot. After the bleeding has occurred, some will have stroke like symptoms with, for example paralysis of one body half. Many will also have elevated temperature and stiffness of neck and back. Some victims will before the bleeding experience precursory symptoms with mild headache, light sensitivity and nausea. This is called warning bleeding and may be an indication that an aneurysm will soon burst. When suspecting bleeding under the middle meninges, or in the head, one should immediately contact a doctor or the emergency services. The symptoms of a "warning bleeding" are very general and seen in a wide range of other diseases as well and are therefore difficult to catch. It is impossible to examine all headache and nausea sufferers for bleeding in mid meninges, but when the patient has experienced a crack or snap in the head followed by severe headache and any other of these symptoms it is right to be vigilant and seek professional assistance. Many people have an aneurysm without it ever bursting. Sometimes these are discovered by chance on a scan and it is then up to the doctor and the individual, if you want to remove the aneurysm. 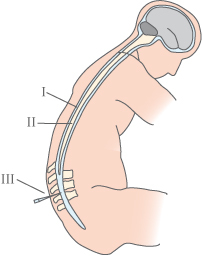 I. Spinal cord. II. Spinal canal. If there is suspicion of bleeding under the middle meninges the examination involves a CT scan of the brain. This will in many cases show the blood, which is around the brain. If inconclusive a lumbar puncture is performed to take a sample of fluid from around the spinal cord, which is in contact with the fluid surrounding the brain, to see if there is blood in the fluid. A MRI scan of blood vessels can show where the aneurysm is located, and thus help prepare for the best treatment. 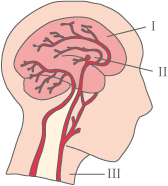 Patients are very poorly after a bleeding under the middle meninges, and treatment is primarily aimed at stabilizing the respiratory and circulatory systems while locating the problem. Unconsciousness might last a good while. Where possible the burst aneurysm will be closed. This is done either by surgery by fixing a clip to the ruptured blood vessel, or by a newer method, coil treatment, passing a long thin probe through the blood vessels to the brain where the aneurysm is lined with small metal wires. Bleeding under the middle meninges is a serious condition. A frequent complication is spasm in the blood vessels i.e. contractions, which prevents oxygen from reaching the brain tissue in the vicinity of the rupture. Vascular medicine expanding the blood vessels might be applied, but is itself in many cases causes worsening of the symptoms. Just over one third of cases with bleeding under the middle meninges end in a fatal outcome. The risk of a new bleeding is reduced greatly if the aneurysm is clipped, but it is still significant. In addition for many patients the bleeding is followed by considerable damage to the brain and its functions. If there is not an aneurysm, but bleeding from unknown causes, the risk of re-bleeding is very small.